Mini Small Clip Design -- Special designed with the small clip to stick with you anywhere, suitable for all kinds of outdoor sports.it is equipped with specially designed arm band (free gift). you can do any exercise you want to do without any trouble. 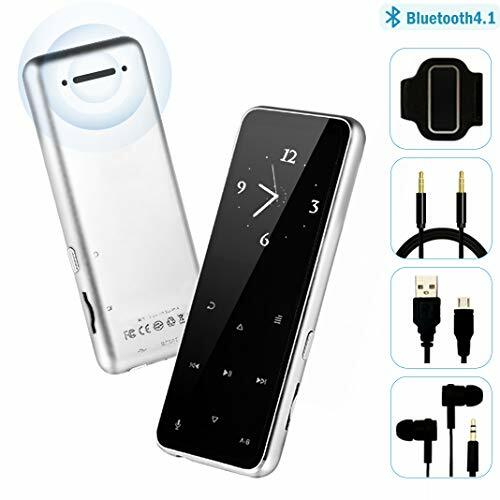 Bluetooth Function -- Support Bluetooth version 2.1 and above,you can play the music through Bluetooth speaker or Bluetooth headset.Bluetooth mode is compatible with cars of 0000 PIN code (not with random PIN). 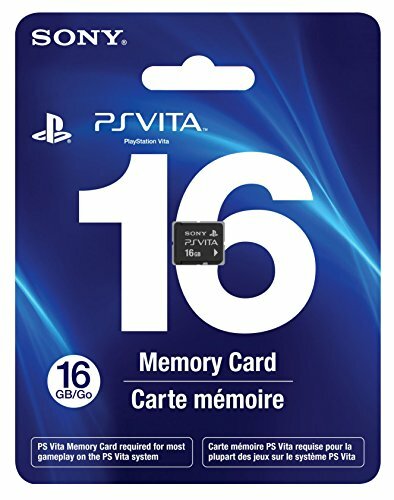 16GB Big Memory -- The machine itself has 16GB of memory, TF slot makes an extra Miro SD card up to 64 GB possible. The built-in 16GB storage supports max 5000 songs. An extra 64GB Micro SD card supports up to 4000 songs. Add your favorite songs or audio book.Share Your Wonderful Life. HiFi-class Audio Player -- Support music formats:MP3/WMA/OGG/APE/FLAC/WAV/AAC-LC/ACELP and etc. Easy to Use -- With 1.5 in TFT display, Built in independent volume controls, a key to return.User-friendly easy navigation, not worry again about the complex operation. NEW add sport Pedometer, Support play Music, FM(support fm record), Video, display Photos, EBook, voice recorder, clock, and so on.It makes the things you do most even better. BLUETOOTH WIRELESS TECHNOLOGY-- Pair the MP3 Player with your favorite Bluetooth wireless headphones for even more freedom in your workout. 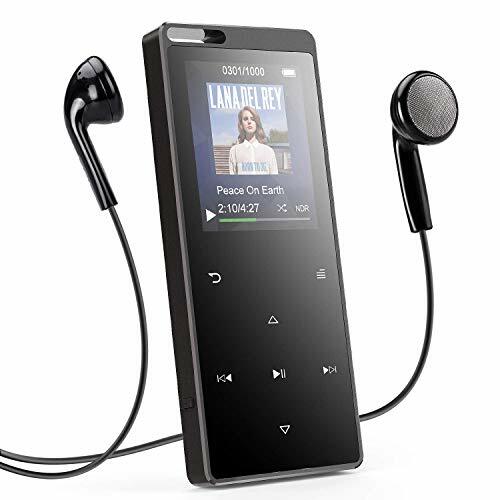 HIFI SOUND -- The bluetooth mp3 player supports a wide range of file types, ( MP3, WMA, WAV, OGG, APE, FLAC and AAC Audio Files). So there are no restrictions when it comes to making the perfect playlist. 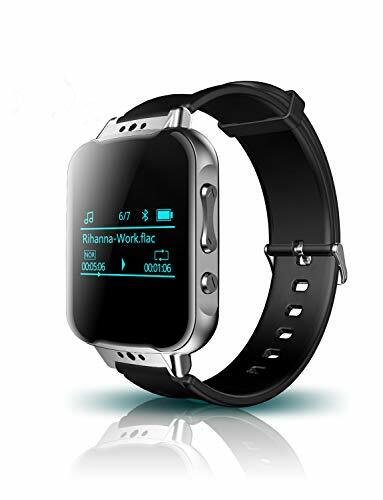 WEARABLE MUSIC PLAYER -- It's a mp3 music player also a watch. A large LCD screen offers intuitive time display. Comes with watchband，you can wear it for a worry-free workout. The digital Player with pedometer to trace your steps every time. PLAYS UP TO 12 HOURS -- With enough battery power to last for up to 12 hours on a single charge. This lightweight music player comes with 8 GB of storage, so you can carry up to 2,000 of your favorite songs or audiobooks. 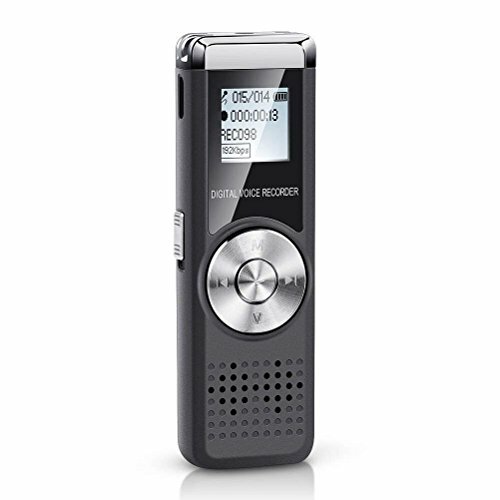 ONE KEY RECORDING --Easily record meetings, lectures, and more high-quality audio with this voice recorder. Recorder device can capture 1536kpbs crystal clear audio. 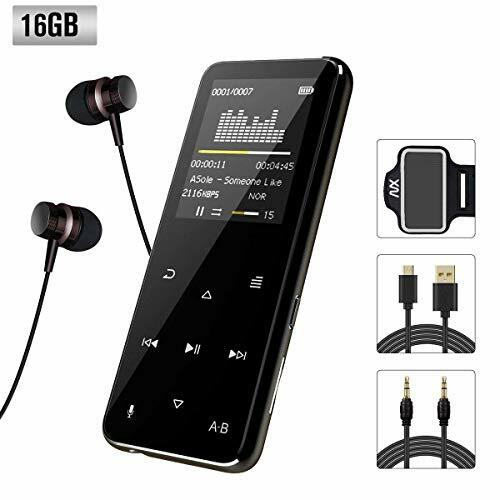 Every TIMMKOO MP3 Player includes 45 days money back & 12-month warranty. 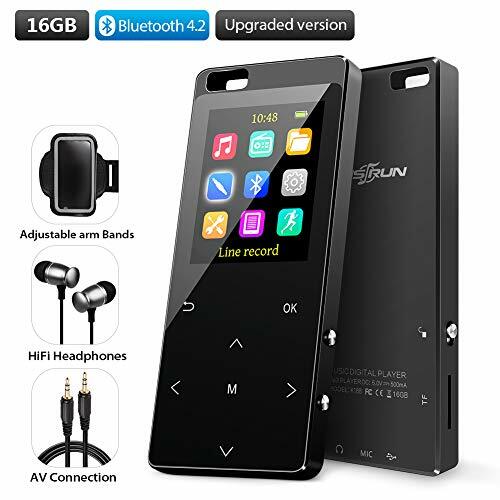 【Mp3 Player with FM Radio】 It can record the music you listen to from phonograph, tape drive, CD, DVD and mobile phone using our designated audio cable, and enjoy it again anywhere you like. This is not possible with other MP3 players. The MP3 player is also a portable radio with headphones. Independent radio IC design helps players get stronger signals. It can easily receive your favorite radio station. 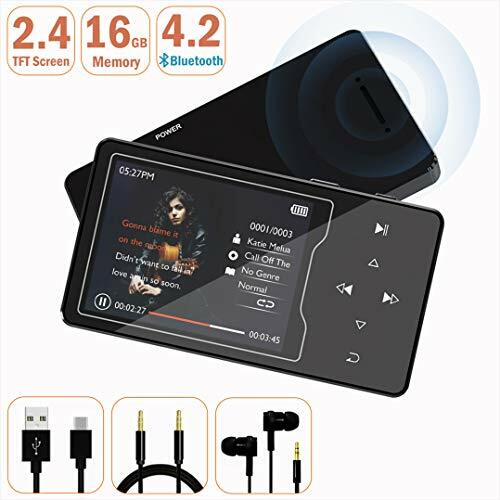 【Mp3 Player with Bluetooth】 When an MP3 player is connected to stereo or headphones, you can return to the main screen and find your favorite songs in the music file. In Bluetooth mode, you can get "bookmarks" or "restore work." You can fast forward or rewind to select the part you want to listen to. The Bluetooth 4.2 MP3 player has better compatibility and lower power consumption. Long distance and automatic connection help MP3 players easily connect headphones and audio. 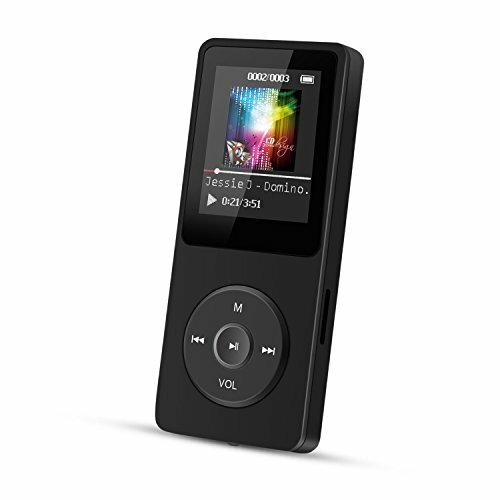 【16GB Lossless Player】16GB capacity allows you enjoying music up to 5000 songs. You can use the extra space to set up a new file to save a lot of files as well. 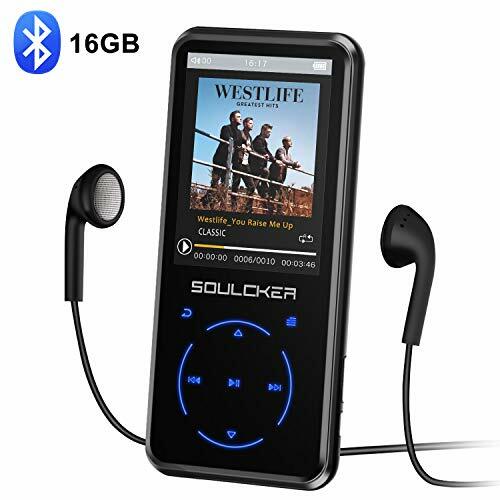 It is HI FI lossless MP3 player with Equalizer, which can support playing Rock, Funk, Hip Hop, Jazz, Classical etc. It supports the below Audio Formats: Mp3/ WMA/ APE/ FLAC/ WAV/ AAC-LC/ ACELP. 【4.2 Pedometer and Armband】Using our sports armbands will give your hands free when running and will make music easier to carry. After you set up your user information, you can start to record the number of steps of your workout, the frequency of the exercise, the calories burned, the miles and time of the exercise. While you are using the 4.2version of the pedometer, you can also return to the main interface and listen to your music. Technology makes life easier and easier. Pedometer&Speaker:Perfect for Sport Running with pedometer function ,record step distance/Calories Burned and Exercise Time.Enjoy the music without headphones for built-in speaker. Bluetooth 4.2: Bluetooth 4.2 means faster transmission speed, stable performance and high anti-jamming capability, you can play the music through Bluetooth speaker or Bluetooth headset. It satisfies all that you want in a music player. Audio Records by one key:HD voice Recording by one key to record high quality and long-time sound. HIFI Lossless Sound Quality:Adopts professional intelligent digital noise reduction chip ensuring high-qualified audio experience. Long Battery Life with 16GB Storage: Max support 128GB,no songs limitation if you choose music from folder option. (Note it is with 16GB intermal storage ,the sd cards is not including. )Last up to 50 hours after full charge,enjoy music for a long time without worrying about the power. 【BLUETOOTH BQB CERTIFICATION】We have pass the bluetooth BQB certification. High-speed and stable transmission within 10 m. Automatically connect the bluetooth device you paired before. You can play the music through wireless bluetooth speakers or earphones. 【SUPPORT COUNT STEPS at BACKSTAGE】Pedometer function is used to record the steps, distance ,time,speed and how many calories consumed. Perfect for fitness, exercise, walking and traveling. You can enjoy music, audio-books, pod-casts at the same time when doing sports with carrying MP3 players and help you release hands . 【FAST LOCK SCREEN & NOISELESS BUTTON】Press the "M" button about 3 seconds to lock or unlock the screen quickly to avoid touching it accidentally. Noiseless button design gives you a better user experience. Multi-Task Running: You can carry Music, Video,Photos and Files at the same time wherever you go. 【POWERFUL FUNCTIONS】1, we have a multiple language system, it supporting 28 different languages. 2. Support video playback, support AMV and AVI format, which need to be converted by conversion tools. 3.Designing for sports, hang rope design, and encough light weight to carry. 4. High quality audio cable: you can enjoy your favorite songs on the road through your car audio equipment by connecting throught AUX line . 【WARRANTY】Warranty of PUERSIT : 100% new product with HIGH quality. 1 year warranty for the free technical support. 93 days for refund or exchange same product in the case of non-human damage. And please feel free to message us if you got any questions, we will reply you ASAP . 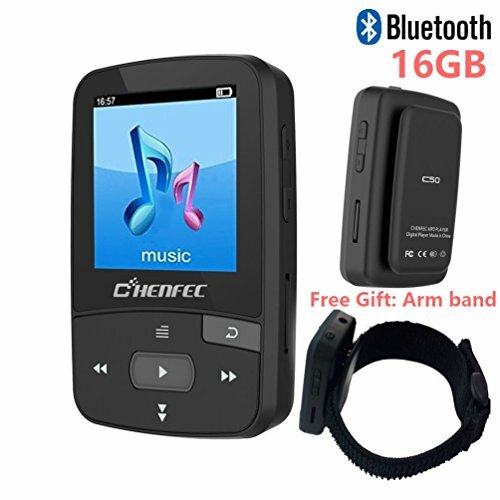 【Wireless Bluetooth 4.0】➤Bluetooth 4.0 MP3 Player, compatible with Bluetooth version 2.0-4.0, fast and stable connection with Bluetooth headphones or speaker, but also ensures HIFI lossless sound quality, you can enjoy your favorite music wireless but our MP3 music player can also work in wired mode.Please note: Connect it to your car by using AUX cable to play your music. 【Dynamic Audio Quality】➤Providing Hi-fi class sound that is close to the original, support most audio formats, perfect sound makes it an essential device for enthusiastic listeners and make your work and life more enjoyable.support most of the popular audio formats: MP3、WMA、APE、FLAC、WAV、AAC-LC、ACELP. 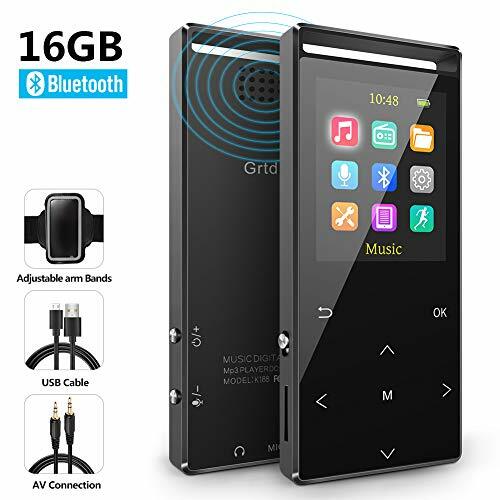 【8GB Memory and 40 Hours Playback】➤This Music Player built-in 8GB memory and The external memory card slot can support 128GB(NOT Included), support storage of over 1500 songs. 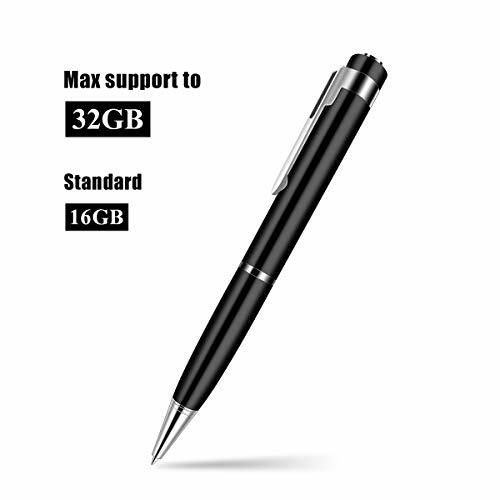 Support up to 40 hours music-playing and fully charged within 2.5 hours by USB charging cable. 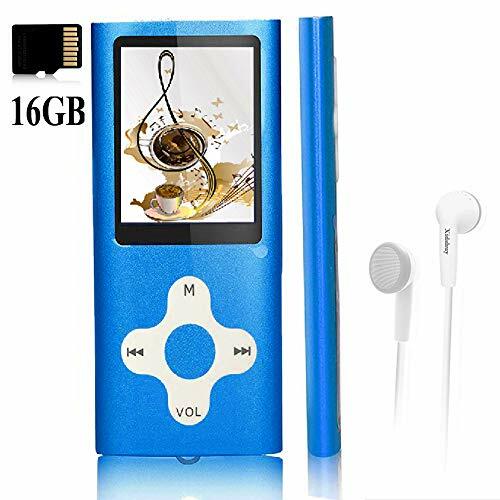 【Multi-functional MP3 Player】MP3 player not only used as a music player, but also support time screen-saver, one button to lock, voice record, A-B repeat, FM radio, resume playback, video, E-book(Support TXT Format Only,does not support audio books). The best choice for music fans. 【 Pedometer Function】➤ After you set up your user information, you can start to record the number of steps of your workout, the frequency of the exercise, the calories burned, the miles and time of the exercise. It is a good companion for sports. LARGE STORAGE CAPACITY: It sets up 16GB of storage in 1536kpbs high quality PCM sound recordings. 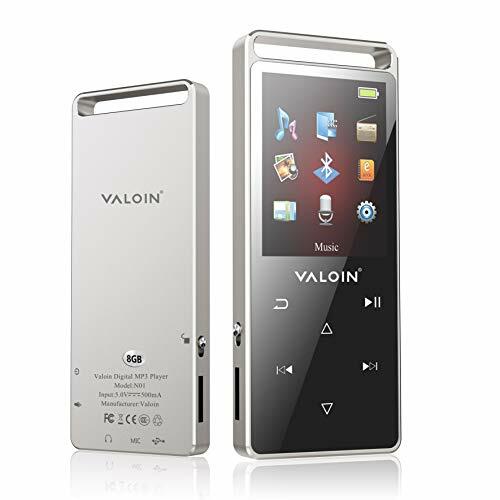 What's more, it can store up to 220 hours of recordings or 5600 songs and can be used as an MP3 player or flash drive. EASY TO USE: No cables or adapter needed, easy to operate, just plug the recorder into USB port of your PC or MAC to download or play recordings. 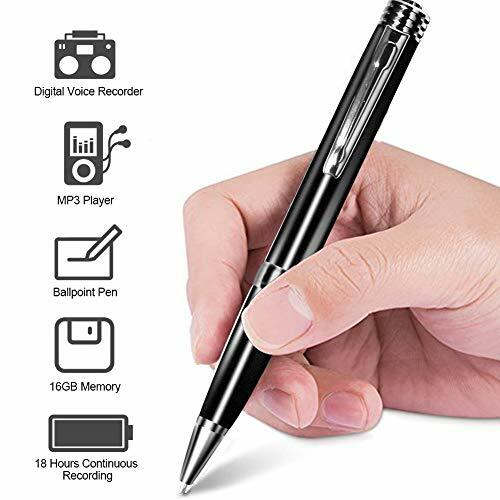 EXCELLENT RECORDING DEVICE: It can not only be used to record your ideas, memos, lectures, meetings, interviews, Suitable for students, professors, teachers, businessman, lawyers, writers, blogger. 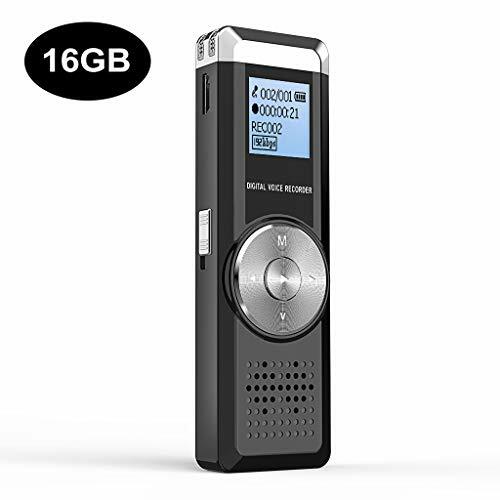 EXCELLENT SOUND QUALITY: 192Kbps PCM voice recorder adopts professional intelligent digital noise reduction chip ensuring high-qualified audio experience and one button recording and saving design, making you super user friendly. SATISFACTION GUARANTEE: We provide 1 year warranty from the date of purchase. If you have any question about our product, just contact us for support. We will try our best to help you till you are satisfied. 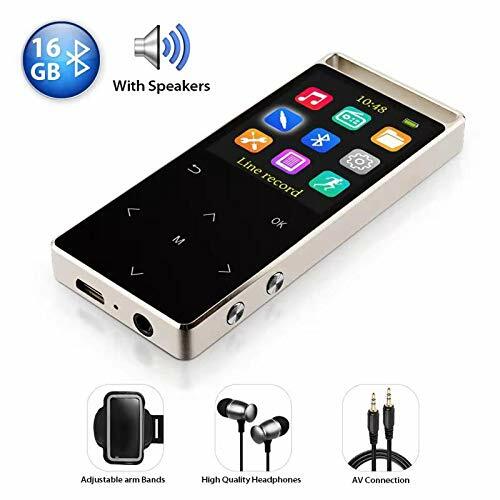 ▶PORTABLE SOUND RECORDER: Compact and portable size with premium metal shell and well operated buttons make it easier for you on the go when use this dictaphone.There are two songs in the Music Mode,Let you enjoy the music when you receive the voice recorder.Please feel free to use it, this is a new product. 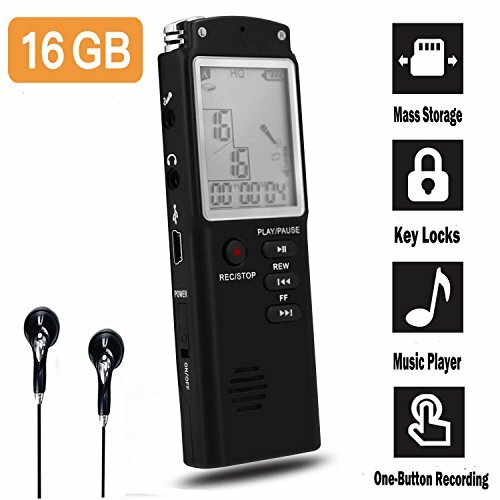 PCM RECORDING & SIMPLE OPERATION:192Kbps high quality recording with original noise reduction chip,let you enjoy crystal clear voice.One key to start recording and saving,which make it super user friendly. You could listen the recording on the recorder, or on PC. VOICE ACTIVATED RECORDING: Turn on VOR switch and forget it.The recorder will auto record when there is sound, and auto save when there is silent.Works even the device turns off. 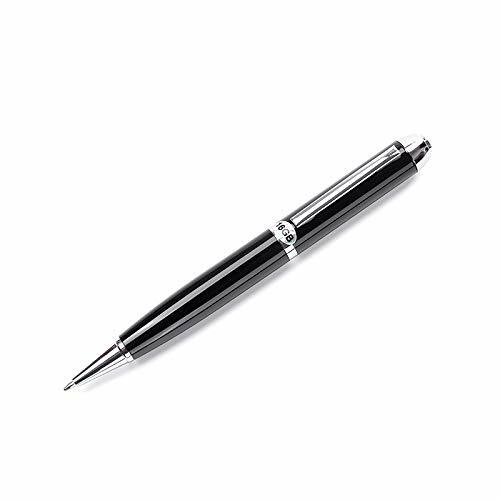 WHAT ADVANTAGE THAN OTHERS：1)High-end metal shell,quality made. 2) Video turoial and E-BOOK will be sent to each customer.3)30 Days full refund & 24 months warranty. Any issues contact seller directly for Excellent Customer Service and leave a satisfied purchasing experince! 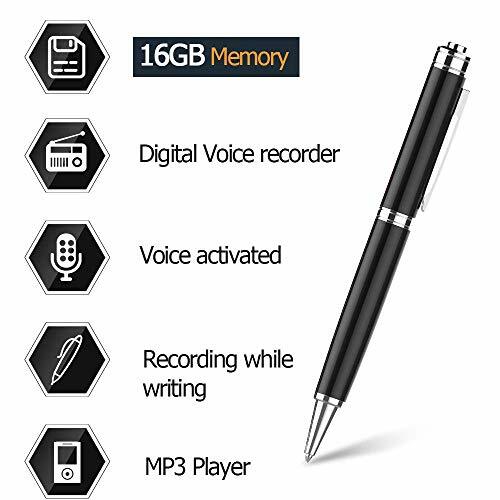 VOICE ACTIVATED RECORDER: You don't have to worry about forgetting to turn on the recorder. This product built in a powerful voice activated feature with independent VOR button, works even the device turns off, no more silent snippets or whisper in your recording now. 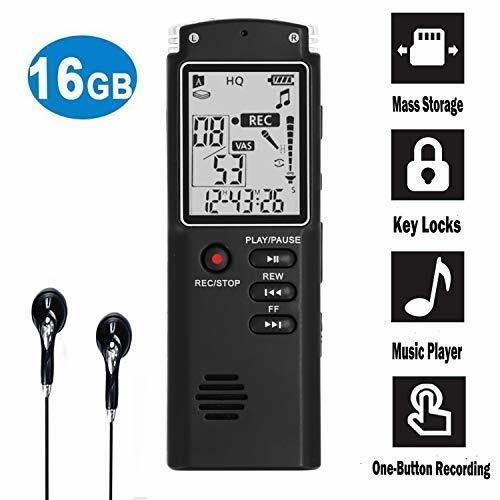 ♬[SUPERIOR RECORDING QUALITY] Clear recording with 192kbps PCM voice resolution, professional intelligent digital noise reduction chip reduces ambient noise for clearer recordings, letting you feel as if you are actually in the recording scene. 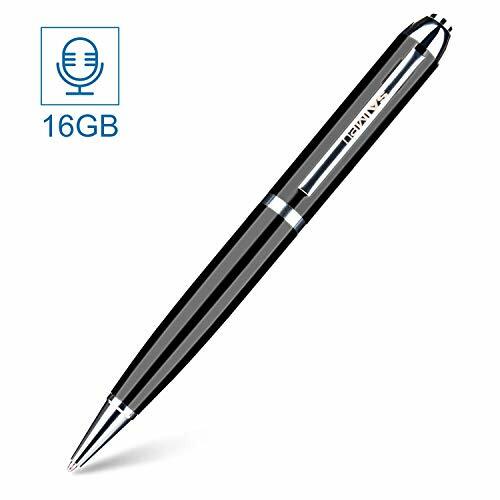 ♬[16GB INTERNAL MEMORY] AHNR Voice Recorder comes with 16 GB of memory built-in, which gives you a max recorded files of 180hours or 5000 songs. ♬[EASY FILE ACCESS] It supports the connection with PC/Mac, easily transfer/delete/manage recorded audio to your Mac or PC via the supplied micro-USB cable. 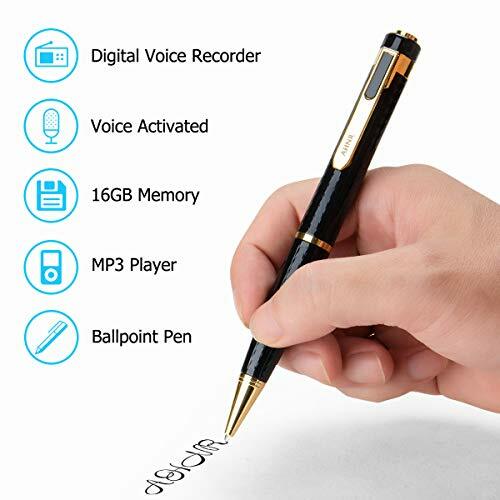 ♬[Mini Digital Voice Recorder] This is not only a Voice Recorder, but also a PM3 Player and Pen. Ideal for college class, business meeting, school lectures, interview & anywhere. 【 BORN FOR SPORTS 】 Awesomeware MP3 player is super lightweight and portable with wearable clip, so you just easily clip it to your pockets or the armband then enjoy music without any trouble when exercising. Coming with a reflective armband, silicone case and Bluetooth design, this MP3 give you more freedom and frees you from tangle cables. 【 WIRELESS BLUETOOTH 4.0 】 The mp3 player is compatible with Bluetooth version 2.1-4.2 and supports most Bluetooth audio devices. Bluetooth wireless technology assure you a pleasant wireless music playing experience both indoors and outdoors. 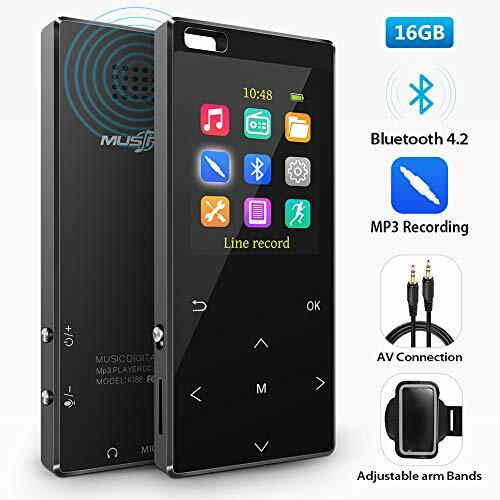 【 SURPER LARGE CAPACITY & LONG BATTERY LIFE 】 AwesomeWare MP3 music player comes with 16GB internal capacity and supports up to 128GB SD Card (not including). You have got enough place to hold your thousands of songs in all. Besides, the music can be played continuously for up to 30 hours with 3-hour fully charged battery. 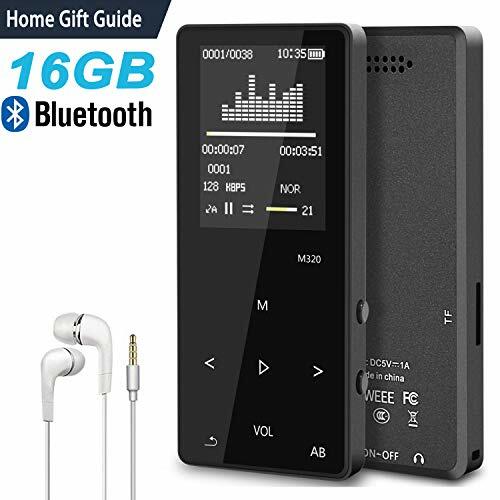 【 HIGH QUALITY SOUND 】 With beautiful songs flowing in your ears, this portable mp3 player features deep and rich sound quality, supporting MP3, WMA, APE, FLAC, WAV, AAC-LC, ACELP, and other popular audio formats. There are seven sound effects awaiting you to select. Add the most proper effect to the music, then enjoy the perfect sound feast. 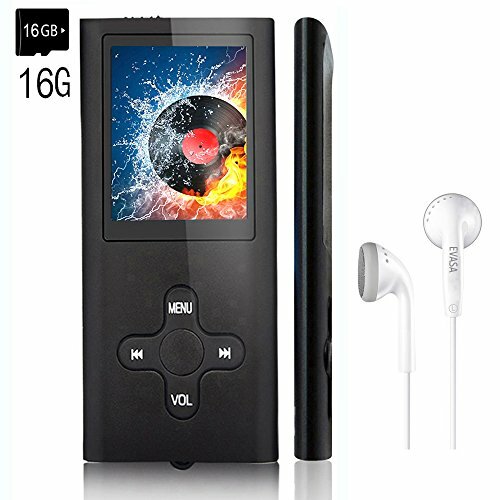 【 100% SATISFACTION GUARANTEED 】 This trendy, durable and wearable mp3 player comes with 45 Day Money Back Warranty and Lifetime Service. No matter what problems you met, please feel free to contact us. We will make every effort to help you solve them. 【 Bluetooth 4.2】Waterproof Bluetooth&8GB MP3 2-in-1 Headset lets you play music and answer calls - easy to use and allows you to jump from listening to music to answering calls quickly and easily! 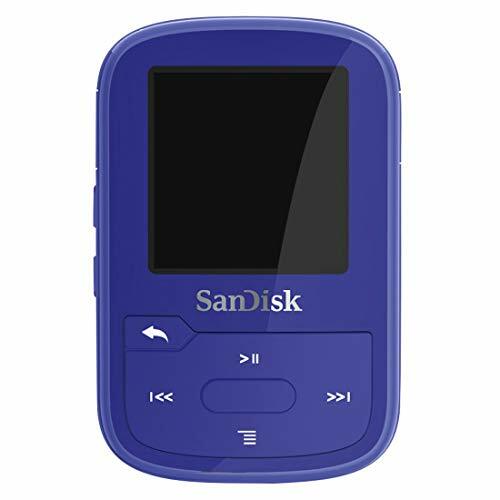 【Built-in 8GB Memory 2000song】Up to 2000 songs can be downloaded,support many format audio formats,wont boring anymore when swimming,surfing or diving,enjoy music anytime anywhere. 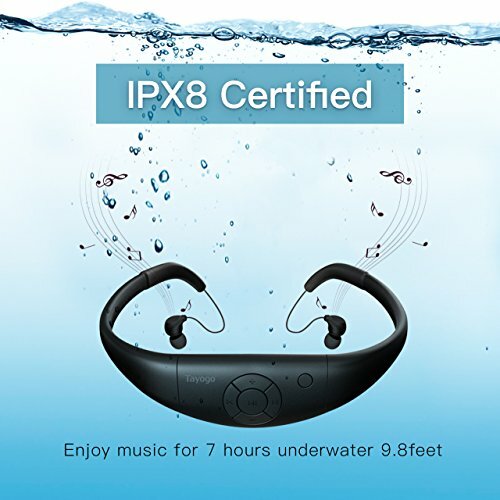 【 Waterproof IPX8 & Humanized Design Earplug】The water resistant and splash proof construction is perfect for any active sport indoors or out, this is waterproof IPX8.Go biking in the rain or jump in the pool, all while enjoying your favorite songs! delivered with a humanized design spiral earplug, it fit perfectly in the ear and NEVER fall out or hurt your ear. 【 Smart APP 】Smart APP allows all in one-All the functions into one. No need to bring lot of device with you. Phone call is in priority, will not miss your phone call even if you are playing mp3 or FM. 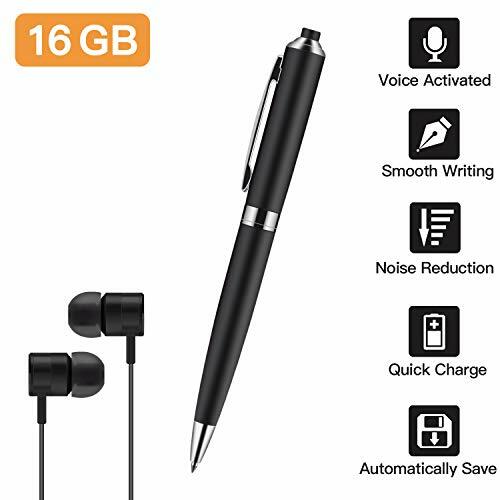 【 Easy usage &12 month warranty 】The Headset is easily recharged by removing the touch button control pad from the headset and plugging it into a USB port like the one found on your Mac or PC, One year warranty, 30days no risk refund. 【DUAL-CORE PROCESSOR NOISE REDUCTION】: Using professional DSP acoustic processor, built-in intelligent noise reduction chip, directly filter the surrounding noise, abilitiy to capture recording content accurately and clearly. 【VOICE-ACTIVATED RECORDING】: The recording can be activated by sound,the silent segment can be omitted to save the storage space. 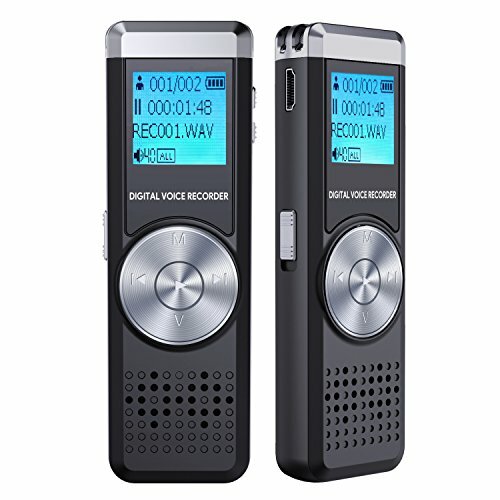 【POWERFUL AND EASY TO OPERATE】: Our digital recorder supports both MP3 and WAV format file which can be easily transferred to MAC or PC;recording files saved with time stamp;one switch to record and save.Audio recorder has metal solid case,lightweight and it is portable. 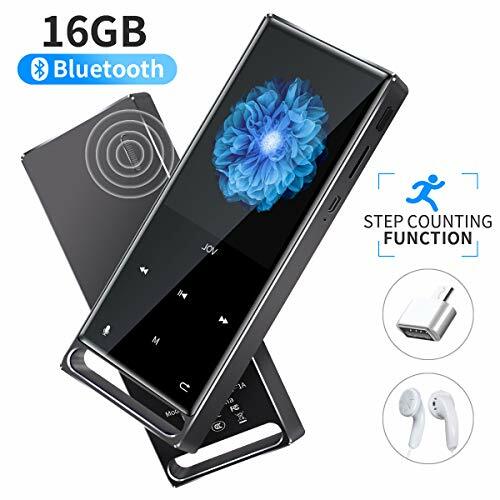 【16GB Storage】--16GB super large internal space for recording or songs,enough to record 180 hours sound files or 4000 plus songs.You can also use it as a U-Disk to save other documents. 【EXCELLENT AFTER-SALES SERVICE】: SAIMPU provides lifetime warranty with professional customer service support. (Service card comes with your package.) (WARNING: Does not fit for recording with external microphone). 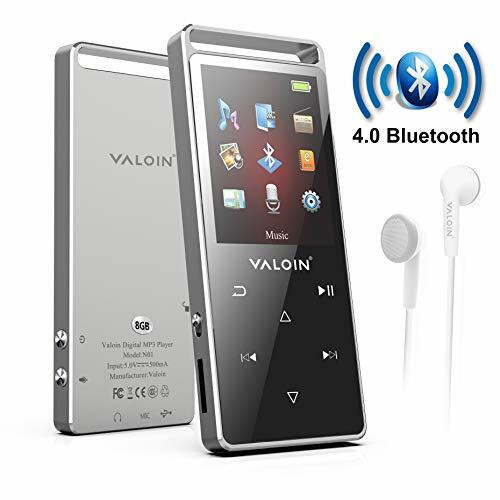 【MP3 player with bluetooth】 Support Bluetooth version over 2.0 and below 4.2. High-speed and stable transmission and high anti-interference ability enables easy use both indoor and outdoor and assures pleasant wireless music playing experience. You can play the music through Bluetooth speaker or Bluetooth headset. With Audio Line, Mp3 player can be connected with cars. 【HIFI Lossless Sound Quality】 It adopts professional intelligent digital noise reduction chip to reduce noise, ensuring high sound sampling rate and providing Hi-fi class sound that is close to the original. Excellent Sound Quality, Support Audio Formats: Mp3/ WMA/ APE/ FLAC/ WAV/ AAC-LC/ ACELP. 【MP3 Player with fm Radio 】Connect it with your own metal earphones and it will become a portable radio. Its independent receiver IC design enhances the signal so you can listen to your favorite stations clearly. 【Long Battery Life & Fast Charge】 Up to 50 hours of playback with 3 hours of full charge. You can enjoy your wonderful musical journey with HD Quality Headphone. You can charge it with computer or the general charger which output is "5V, 0.5-1A". 【Multi-functional】 Scientific step count with the pedometer inside the system as well as with the lossless music keep you company when running and take the calories burnt in record; with the adjustable armband coming along, enjoy your sports in any way you like.Packaged in a gift box, this trendy and durable product is the best choice for a Christmas gift. 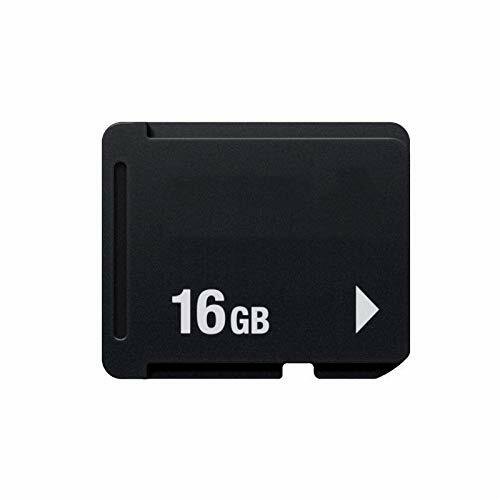 LARGE MEMORY:16GB Internal Capacity for up to 4000 songs, supports up to 128GB Micro SD Card! (To avoid incompatibility, please use AGPTek Memory Card). 70 HOURS AUDIO PLAYBACK:only need to charge it for 3-4 hours. You can charge it in computer or with the general charger which output is "5V, 0.5-1A"
PORTABLE FOR SPORT: Shock absorption surface and it only weights 1.1 oz. Smart but Big Music. 【Bluetooth 4.0 Function】Bluetooth 4.0 supports simpler and faster connection with Bluetooth headphones, and reduces the power consumption of the product. Keep you away from the cables. 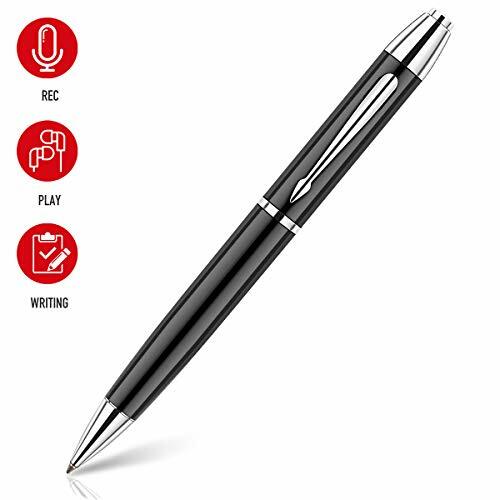 4-In-1 Function: It not only has recording capabilities, but also has a music player, write and USB storage. 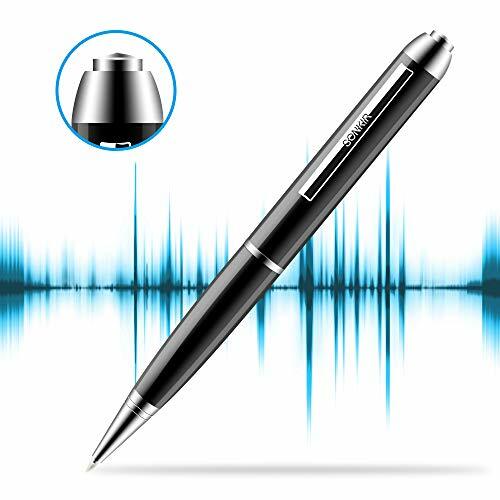 You no longer have to worry about writing too slowly, just one click to open the recording and easily record the entire content. 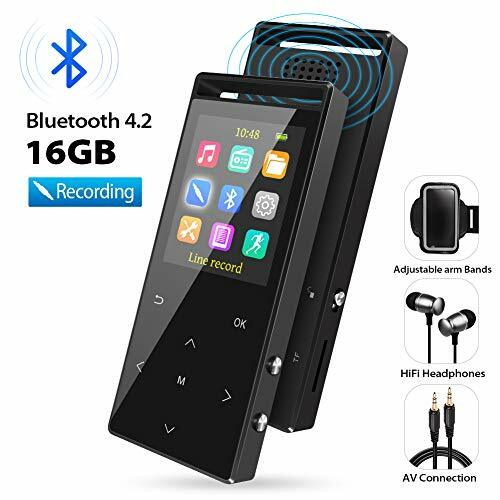 Suitable for meetings, class recordings, interviews, etc. 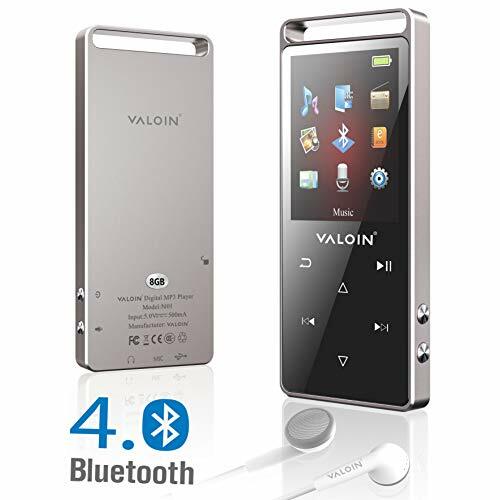 ❤【HiFi Lossless Sound Quality】This Bluetooth MP3 Player has passed the professional music laboratory test. It adopts professional intelligent digital noise reduction chip ensuring high-qualified audio experience. It supports equalizer choice:Rock , Funk, Hip hop, Jazz, Classical, Techno and Customize. Support most of the popular audio formats: MP3、WMA、APE、FLAC、WAV etc. 【BLUETOOTH Version 4.1】You can play the music through Bluetooth speaker or Bluetooth headset. 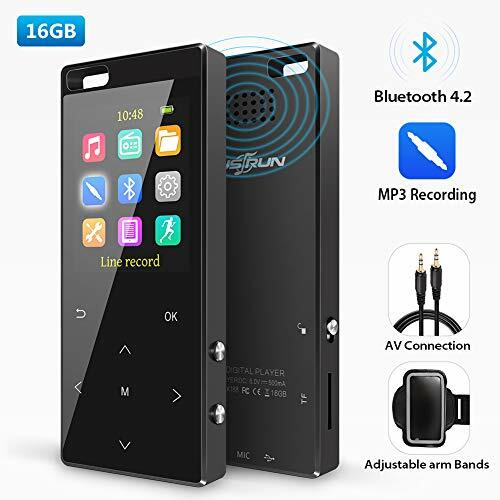 With Audio Line, Mp3 player can be connected with cars. Support connection to Bluetooth headphone. 【High Sensitivity Touch Button】8 high-sensitivity touch buttons with backlight for night operation allow you control the player without making any noise, Easy Operation. 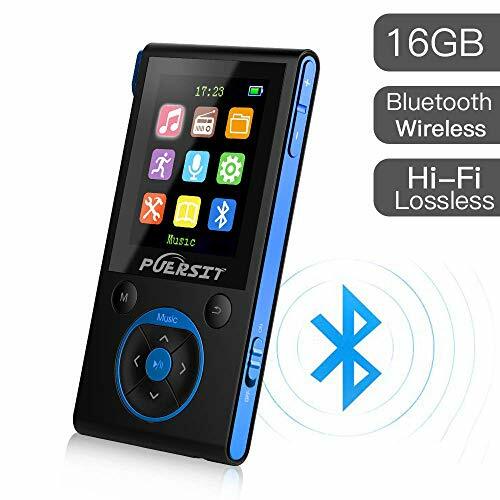 【Large Capacity & Long-life Battery】The Bluetooth MP3 player with 16GB of built-in flash memory, and supports up to 128GB TF Card (NOT INCLUDED); Up to 70h music-playing with 1-2Hours of Full Charge. 【Born for Sports】Designed with music play, voice record, FM radio, E-book, video play, photo Browsing, time screen-saver, one button to lock. 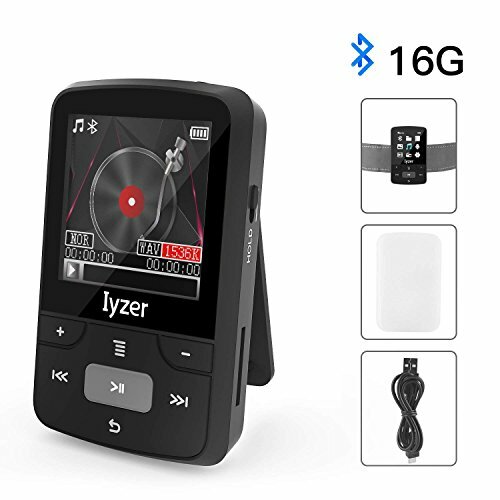 All these functions are combined into this mp3 player. The pedometer inside the system as well as the stop-watch can keep you company when running and take the calories burnt in record, and enjoy your sports with the adjustable armband in any way you like. Perfect for Sport, fitness, Running, Traveling ect. 【WHAT YOU GET】1 x MP3 16GB, 1 x Earphone, 1 x Audio Cable,1 x Micro USB Cable, 1 x OTG Adapter, 1 x Armband, 1 x Storage bag, 1 x User manual, 1 x Marketing card,1 x post-sale service card, one month no reason money-back guarantee and 18 moths Replacement Warranty, support 7*24h technology service, 24 hours quick reply. 【Bluetooth 4.0 】Built-in Bluetooth 4.0,it is possible to connect with bluetooth equipment(such as bluetooth speaker,bluetooth earphone,bluetooth headphone). 【Unique Design&Easy Operation】It made of alloy, colorful display and glowing touch buttons, a lot of luxury is overflowing. With the lock button, erroneous operation can be avoided.High Sensitivity With touch sensor function,smart design makes it easier and smoother to operate.